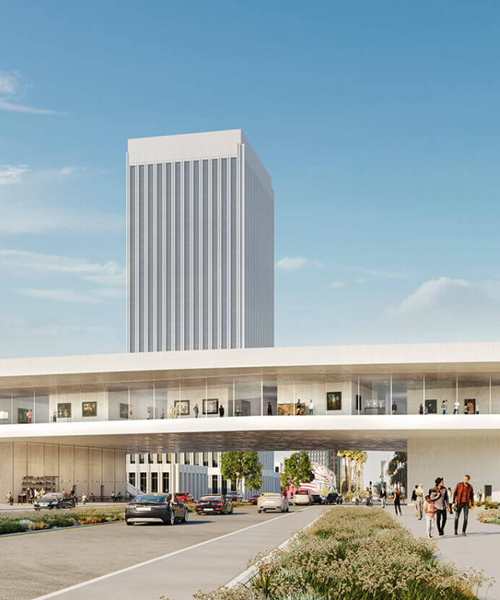 peter zumthor’s revised plans for the los angeles county museum of art’s new museum building have been approved. the project, previously covered on designboom here, will be known as the ‘david geffen galleries’ and will house LACMA’s permanent collection. three new renderings of the proposal illustrate a smaller building with a reduced maximum height. as a result of these changes, the project’s environmental impact has been curtailed, while the project’s aesthetics remain the same. on april 10, 2019, it was confirmed that the project had been approved by local authorities, with construction documents now set to be formally drawn up. 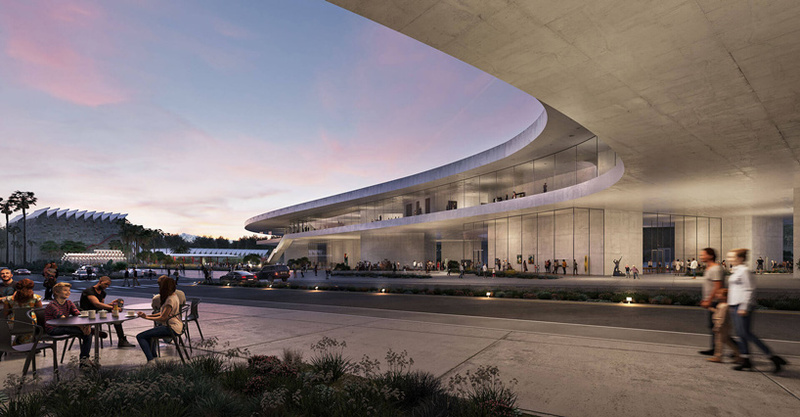 LACMA’s new building will be composed of seven semi-transparent concrete and glass pavilions that support an elevated, organically shaped, and transparent main exhibition level with a floor-to-ceiling glass façade. zumthor’s design includes new outdoor landscaped plazas, public programming, educational spaces, sculpture gardens, and integrated native and drought-tolerant vegetation. a new parking lot will also be created as part of the scheme. in april, the los angeles county board of supervisors met to certify the project’s final environmental impact report (FEIR) and rubber stamp the project. 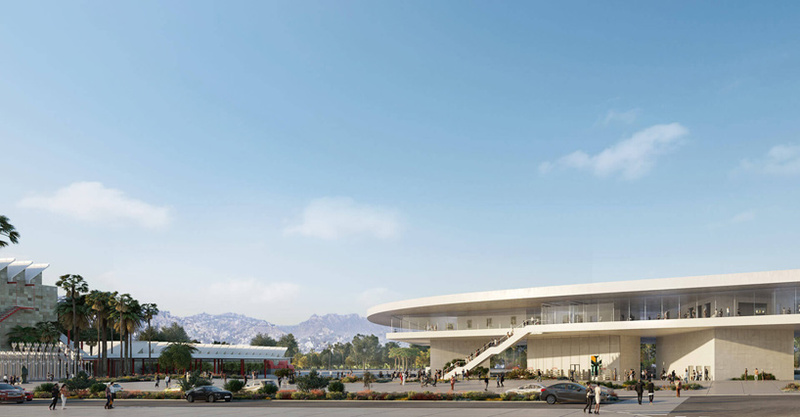 construction documents will now be drawn up with demolition and construction to begin in late 2019. completion is forecast for the end of 2023. see designboom’s previous coverage of LACMA’s new building here. A huge mistake removing the chapel galleries, which would have been the highlight of the museum. Large open galleries are necessary to break up the claustrophobic experience. The museum is now a collection of small rooms. The remake of the museum is already small and now it’s losing 40,000 sq feet of space. 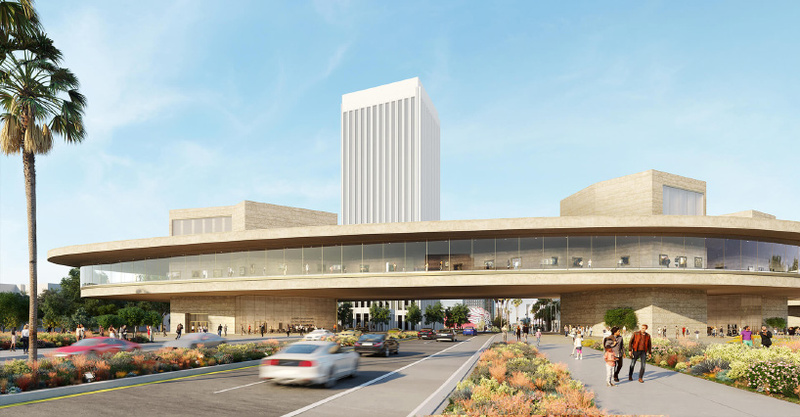 LACMA should spend the money buying that horrible high-rise across the street, add some exterior elevators and host a design contest to re-imagine the exterior. Then, do not allow anyone else to build near the monument to art! I’ve seen LACMA thru a lot of changes, this is the worst. It looks like a bad mid-century motel.